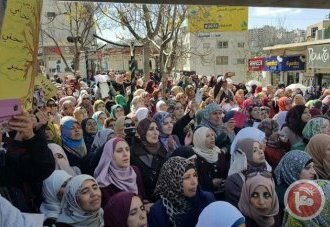 The Palestinian public school teachers’ strike, which started 2 weeks ago with partial work stoppages followed by open strikes, continues as the Palestinian government has failed so far to fulfill the demands of the teachers. In addition to their demands for improving their wages and benefits, the teachers’ protest movement is also asking for the organization of free and democratic elections in the Palestinian Teachers’ Union, so they can elect their representatives, noting that Palestinian Teachers’ Union is considered by the Palestinian Authority as an organization of the Palestine Liberation Organization, and its leadership is appointed by political factions. We thank you for your solidarity messages with the teachers’ movement, which have contributed in the liberation of the teachers arrested for participating in the protests. As the strike continues, we call upon the international trade union movement to express further solidarity with the public school teachers’ protest, and urge the Palestinian government, represented by the Prime Minister, Dr. Rami Al-Hamdallah, to accede to their demands. Please send your solidarity messages to isam_dababseh2@hotmail.com, and a copy to extr@dwrc.org.